I actually went sort of simple for Beeper's birthday party this year--just a little party outdoors at a favorite local playground with lots of friends and some balloons and cupcakes. 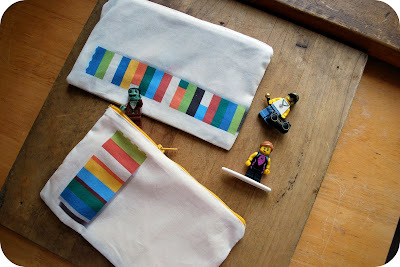 Since it was still supposed to be a Lego themed party, I made these little zip pouches printed with multi-colored stacks of Legos as favors--I figured the kids could re-use them as pencil pouches, or just to hold a few Legos for building on-the-go. 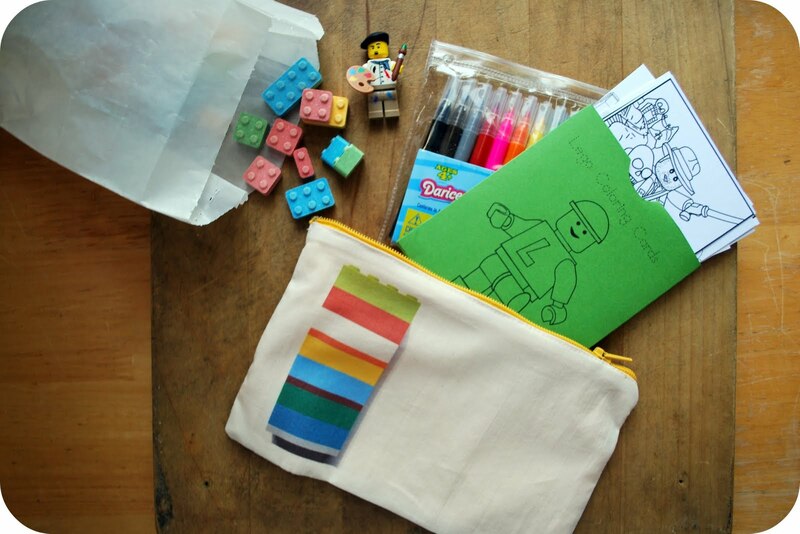 I stocked each pouch with a tiny set of markers I found in the $1 section at Target, a small half-moon envelope I made and filled with a few Lego-themed coloring cards, and one of the Lego mini-figures (dang, the kids love those figures). Of course, there were some games. 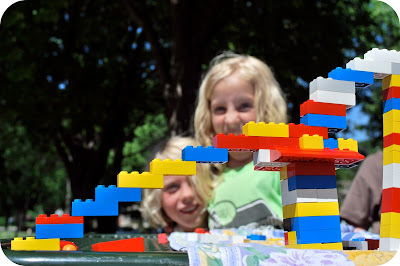 I bought a couple of large plastic bags of Legos secondhand at the thrift store and put them in a large jar for use at the party--then I dumped them out on a picnic table and had the kids work in teams to build as tall of a lego tower as they could in 2 minutes. 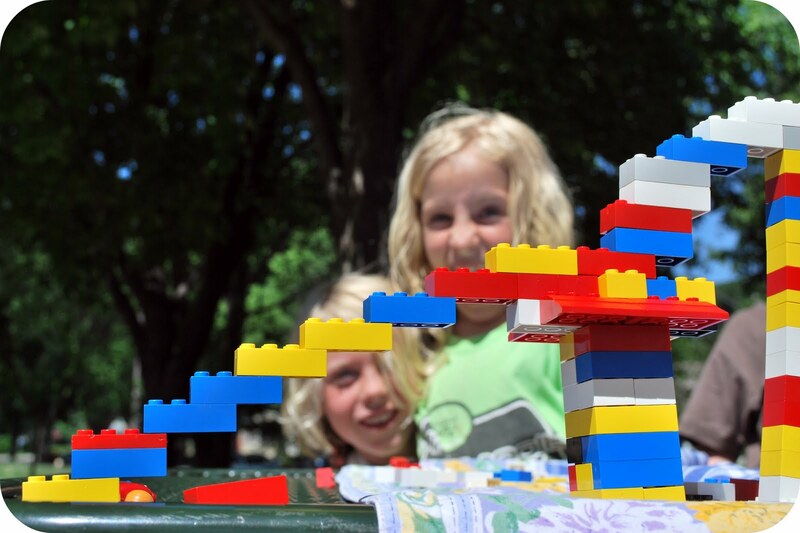 In order to win, the tower not only had to be the tallest but it also had to be able to stand on its own--extra mini-figures went to the highly-envied winners. I also had them build their own lego creations and present their creations individually to the group, describing what they had built and demonstrating any special functionality. This game was fantastic because they were each so proud of their creations--we gave out glassine bags of those lego-like candies you see in the first photo as prizes for each of them. Other than that it was a lot of running around willy-nilly at the playground, eating loads of watermelon, playing with caterpillars that were falling from the trees, and spitting sunflower seeds at one another--or what I think may be the perfect party for a 7 year old. 1) Lego Zip Pouches--I have put the image of the lego stack I printed on the fabric out in my Flickr account if you would like to use it in whatever creative way you desire--you can find it here. There are also several Lego mini-figure images out there if you would prefer to use those too. I made the pouches using the same downloadable tutorial instructions I made a while back for the art supply pouches--you can find it here. These particular pouches were all made using a single 8.5x11-inch piece of fabric that I printed with the lego design (more about printing on fabric here too), and lined it was a nice bright lego-ish solid color that matched the zipper. Each pouch probably only took me about 30 minutes to make. I also uploaded a copy of the exact design I printed on the fabric, with the lego image placed for printing on a 8.5x11 piece of fabric which you can then turn into a zip pouch. You can download that here: DOWNLOAD LEGO POUCH. Both designs you see above are in there. 2) The Half-Moon Envelopes with the Coloring Cards--I put a template out for you to download in case you want to make some of those: DOWNLOAD HALF MOON ENVELOPE TEMPLATE. The coloring cards were all made from stuff I downloaded from the Lego website or from this website and this website--I just resized them so they fit 4 to a page. I also put the Lego-Man graphic--found here--on the front of the envelope, which you can customize with your own headline before you download it for printing. Incidently, I buy all my paper from Paper Source, if that is of interest to you--they make lots of nice bright sturdy papers that are good for printing. 3) The Invitation: while I never did post a photo of the actual completed invitation, I did share the photo I used for the invitation with you--see it here. For those I just printed the photo out and attached it to a bright yellow post card with red photo corners and sent it out in blue envelopes (again, Paper Source). But if you want to use the photo I made for the invite, please feel to use that as well--you can also find that in my Flickr account, right here. So, there you go. Go forth and build you own Lego birthday party, if you want to. 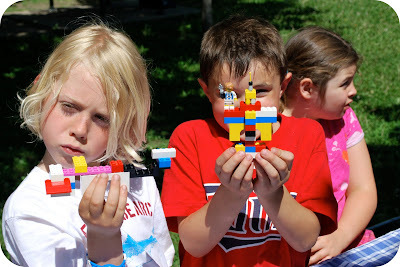 Or maybe just make one of the Lego-emblazoned pouches for a little someone special who has a soft spot for Legos. Whatever, do what you will--I'm just the hired help here. Grand! 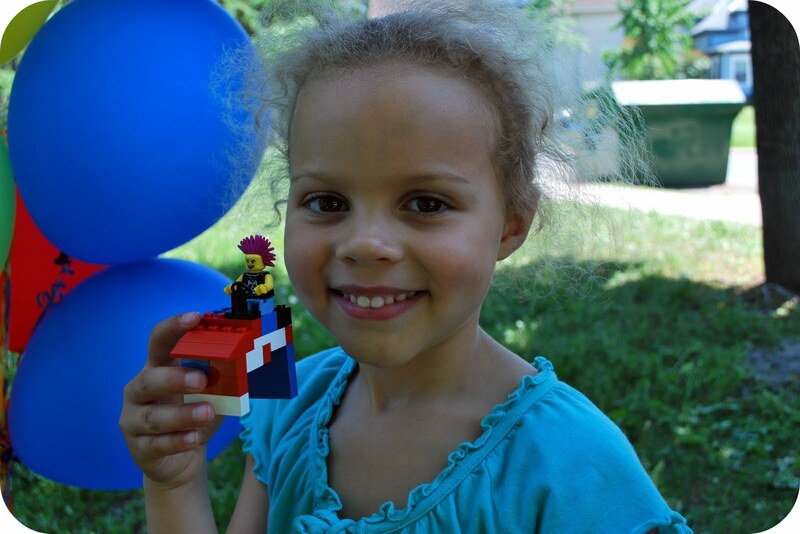 Our 14 year old played Legos for 7 hours yesterday with the 5 year old...I wouldn't be surprised if a Lego birthday party is requested in November. Thanks so much for putting up all of these great party ideas! Ah! These are so brilliant! I was just thinking about ways to store all of those little legos. I thought glass jars would be nice but now it seems some little bags like these would be perfect....It looks like you all had a grand time...how nice! Hope this finds you well! a.
Oooh - I just got a zipper foot,too. Those are super cute! The bags are such a great idea, you can toss them in a purse or backpack. Thanks so much for the details, I'll be linking. Just found our site. A new sewer but I'm going to attempt these for our crayons and markers, etc. My little one LOVES art and I've got supplies all over. A pouch would be perfect. BTW I was formerly Holly Keller too. Was amazed to find another in this big world. I'm so shamelessly stealing so many of these ideas. Last year I managed to make a lego cake and call it good. This year your ideas are making it so much easier to pull this off. Thank you for sharing!